This is a very contemporary, ‘urban-chic’ look which means strong lines and straight edges. 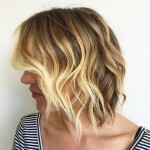 This version is ultra-fashionable as it moves away from the black roots, to a softer contrast shade of caramel showing just a little at the roots and then carried throughout the pale blonde base in striped highlights. Styled off the face with one side pushed back behind the ear creates an asymmetrical vibe that’s strong, but casual. 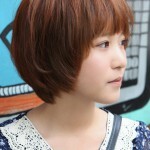 This short straight hair style is perfect for oval, oblong, and heart faces. 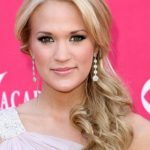 Under: Short Hairstyles 20 Trendy Short Haircuts for Cool Summer Style!